A little more about the sew-along, Fall for Cotton. Well who knew buying cotton could be so tricky. The pattern I have picked for this project is draping jacket and as such a stiff cotton just would not do, and I wanted something nice and soft to feel comfy in, for the cooler autumn months. First I went through my own small collection of material, ok not so small, (but they were all bargains and will be used at some time) thinking that there must be something suitable amongst all that lot. Most of what I have I have bought from the kind of places that don’t really tell you what the material content is, and to be honest I never really bothered about it, I know that I have to be extra careful when ironing some items, but is the material ‘felt’ right I got it. Anyhow after a good sort though that turned up a few items I had forgotten and increased the to-do list somewhat I had possibly 3 materials that might be cotton and a little bit of flowery stuff that I knew was cotton, but wouldn’t do at all for this pattern. So outside I headed next to do the burn test. 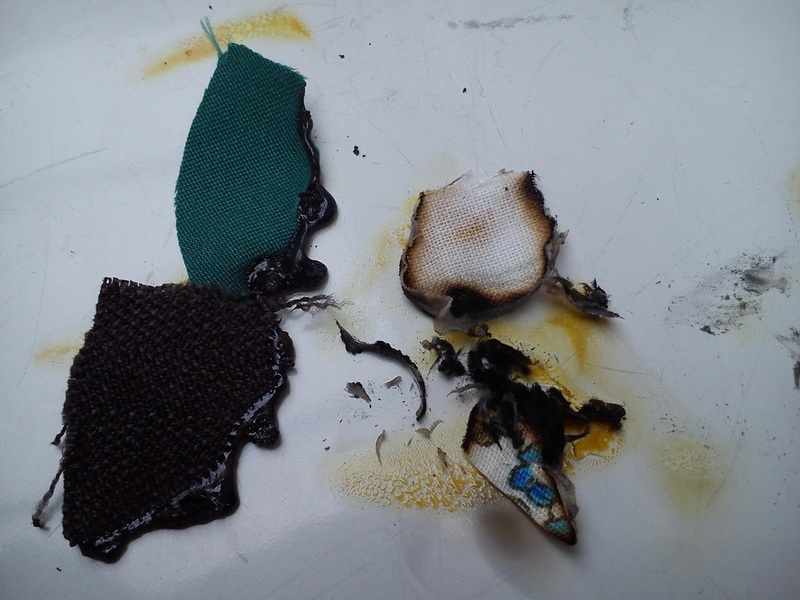 I had research this bit on the internety and apparently you can tell a bit about the content of material by the way it burns, this does make sense when you think about the way synthetics melt with heat. Well I took a square of each and a test bit of the flower material as a guide to what should happen. This didn’t prove to be a easy as I had hoped. When I arrived I asked to be pointed towards the cotton jersey, as I thought perfect for draping. Only one roll had information on it saying 100% cotton and it was white and way too thin. So I asked about the rest of the unlabeled ones, and one assistant told one shelf was full of 100% cotton, so i picked one from there. But when I checked that the material I had chosen was really 100% cotton another assistant insisted that there was no such thing and a cotton would never stretch. Anyone out there know which is right? I always thought you could get 100% cotton jersey. I wasn’t overly enamoured with the roll I had picked anyway, so I asked this second assistant for more help; what could I do to get a cotton draping? Well we mooched around for a while finding numerous stiff cottons, but nothing like what I was hoping for until we approached the bed sheeting area, and there was soft brushed cotton in a lovely warm cream. Now this may not be the best idea for this jacket as I can see it bobbling before my very eyes, but it might make an interesting experiment, and as the material was quite cheap I really could use it as a draft pattern for a more expensive wool later on, and it will make something lovely and cosy to snuggle in. I did a quick burn test on it when I got home and it burnt the way I hoped. So on to the next stage, cutting out.